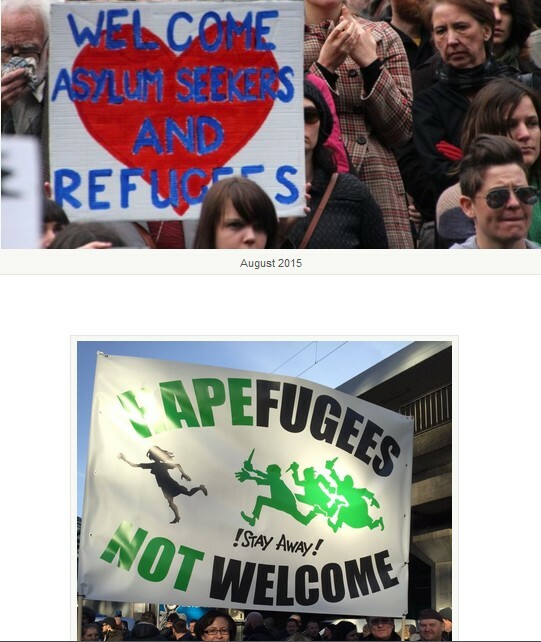 January 20, 2016 "Information Clearing House" - "Oriental Review " - Last September we published an outline of the analysis produced by the Russian investigator Vladimir Shalak on the hidden aspects of the Twitter-based campaign to lure the Middle Eastern refugees into Germany. Having studied 19000 refugee-related original tweets Shalak claimed that the great exodus to continental Europe was artificially arranged by non-European actors. The latest wave of migrant-caused violence in the number of European cities on New Year’s Eve sparked another intense anti-Merkel campaign in German and European social media, and yielded additional data for Shalak’s in-depth research. Was it a tragic but spontaneous development or a deliberate psy operation by an external agent? To come closer to an informed conclusion we have to look briefly at the current US-German relations. Since March 2014′ Crimea reunification with Russia the German Chancellor Angela Merkel found herself between the hammer and the anvil. Under heavy pressure from Washington she had to lead the European family to tighten the escalating sanctions against Russia while big business and her political opponents were increasingly reluctant to sustain them in face of the dire consequences for the German economy. Balancing two contradicting approaches, she opted for accomplishing the 2011 commercial contract to built the second phase of the Nord Stream pipeline that would deliver more natural gas from Russia to Germany via the Baltic Sea despite a growing roar from the overseas. Another dimension of transatlantic tensions is connected with the TTIP agreement talks held since 2013 behind the closed doors. A solid propaganda fog around these talks can hardly conceal the fact that the main issue where the swords are crossed is the status of American private arbitration courts within the European legal system. The global TNCs push for allowing these companies to sue states in private arbitration courts for any action that negatively influences their profits. In practical terms that means a total loss of the sovereignty of the European states as the private arbitration courts will then be able to dictate to the nation states customs duties (directly influencing profits of course), sanitary and phytosanitary norms (EU will have to lift its strict barriers to GMO- and beef hormone products), financial and investment rules for the European banks and even subsidies. No wonder that a ruling coalition party in Germany categorically protests against the TTIP talks. Mass public anti-TTIP rally struck Berlin in October 2015. As a result, now Frau Merkel is emphatically careful in her assessment of the TTIP project. Now, the picture is more or less clear: Bundeskanzlerin plays a smart game trying to maintain European sovereignty while formally complying with the US demands on secondary tracks. No doubt that this game is decoded already by Washington and the only factor that impedes her immediate ousting from the office is the absence of prepared and manageable successor. Nevertheless, a media campaign against Frau Merkel, on the pretext of rapefugees scandal, is in full swing. Early January the notorious speculator and confessed sponsor of the refugee traffic to Europe George Soros gave an explicit interview to Wirtschafts Woche where he bitterly critisized Merkel’s stricter European and refugee policy suggesting that it would “cost her chancellorship”. Simultaneously the hashtag #ArrestMerkel and “Merkel Has To Go” motto appeared in Twitter and gained an impressive circulation. Conducted analysis showed that #ArrestMerkel hashtag was originally transmitted by two major Twitter accounts, @Trainspotter001 and @AmyMek. It was taken up and spread by a number of other powerful accounts. As you see, in both cases the minimum activity is observed between 7AM and 3PM GMT , which most likely corresponds to the US Pacific or Mountain Time. These Twitter activists are therefore active during daytime on the US West coast. 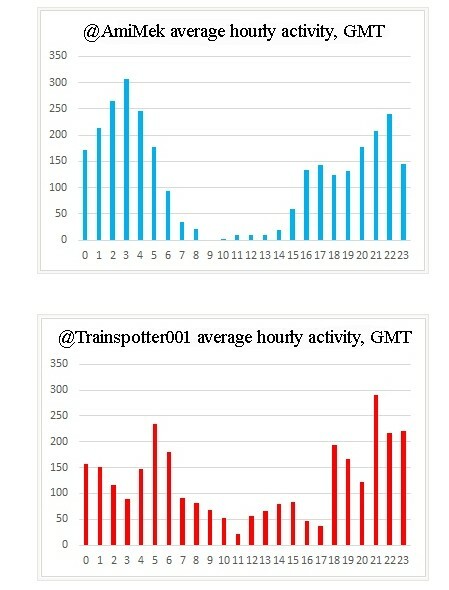 Now, the @Trainspotter001 account has made almost 27K tweets since March 2015, or around 88 tweets per day which too much for a human operator (for example, the whole CNN Twitter team is making around 23 tweets/day). 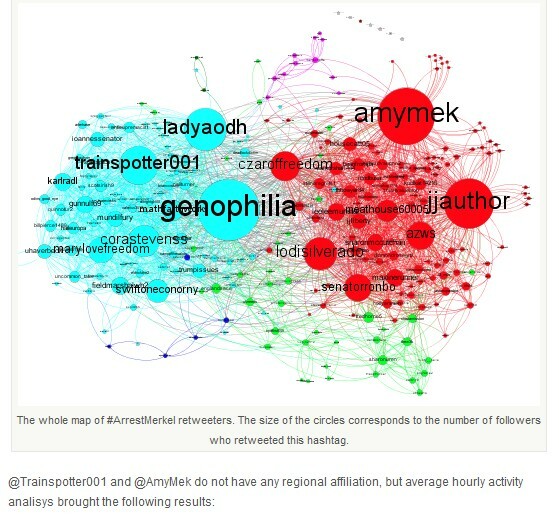 We conclude that @Trainspotter001 is a programmed bot, while @Amy Mek (27K tweets since 2012) is likely too. Going further to major retweeters we see that @Genophilia is the leading bot here (107K tweets since September 2012, or approximately 87 tweets/day). Its region is not indicated but average hourly activity research shows that it is operated from the US Pacific coast as well. Two other notable accounts are @jjauthor, a Nevada-based bot making 300 posts per day since 2010 (!) and @LadyAodh, another artificial blonde profile, created in the Unites States and fighting “white genocide” since March 2015. As you saw at the first graph, all these bot accounts are closely interlaced and thus multiplicate each other’s effect coving multimillion audiences. The presented evidence clearly demonstrates that the whole Refugee Combination was arranged by the US-based agents to frame up Chancellor Merkel and warn her against the defiance and independent stand for the European sovereignty. Quite noteworthy is that the seemingly polar opposite platforms (ultra liberal of George Soros and far right of vague US-located twitter bots) are eventually pursuing the same political goal – to oust German leader from her office and impose the TTIP on Europe. Andrey Fomin is founding editor of the online political analysis journal Oriental Review. He holds a Masters in Russian History (Lomonosov Moscow State University).